CONTACT - Mission Thando Inc.
Mission Thando Inc. is a registered charity in Canada. Please contact us and we will send you a form for AUTOMATIC DEBIT for your monthly support. 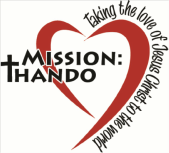 If you would like more information about Mission Thando please fill in the form below.